Architectural monument of national importance. The Building is constructed in the 30's of the 19th century. On a hill 60 km from Chisinau between the villages Gyrbovets and Hodzhineshty at the Ichel River, a friary has stood for several hundred years. The date of the monastery foundation is unknown, but what is known for certain is its first revival in 1730 after being abandoned by the monks that are considered to be its original founders. 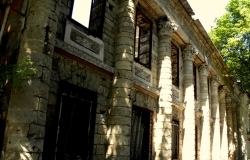 Moldavian boyar Constantin Karpuzov took the lead in the restoration of the monastery. Unfortunately, due to the frequent and violent raids of Turks and Tatars, the buildings erected in the XVIII century have not survived. An integral part of the monastery is the church of the Assumption, built in 1816. The temple is an exceptional early example of Moldavian architecture. The uniqueness of the building is in extraordinary spatial resolution, rich decoration and small windows placed in deep niches. The second church of the monastery is the church of the Descent of the Holy Spirit, built in 1870. The monastery complex consists of a variety of office and residential accommodation: trowels, monastic elders’ homes, stables, cellars and other outbuildings with separate courtyards. All these structures are different with bizarre asymmetric shapes. Their dimensions are understated and this one more time accentuates the grandeur of the temples. For many years the monastery has been keeping an ancient icon, that has miraculously survived all the fires, raids and devastation. The monastery received it as a gift from the widow of Colonel Nicholas Albadueva, who came from the suburbs to the abbot Pachomii and tragically died at the gates of the monastery. The icon was an old family heirloom, being passed from generation to generation. In 1859, the Russian Orthodox Church recognized it miracle-working, but until that time the icon had been honoured especially by believers of Kishinev Diocese. In the Soviet era, for a long time the monastery of Gyrbovetsk remained the only one operating in the MSSR, however it was closed in 1962 and restructure into a school for mentally handicapped children. However, before there was a school the monastery had been plundered. Again, the icon miraculously survived and was returned to the monastery, along with a small part of the old books and icons during its revival in 1992. Within the boundaries of the monastery is buried the spiritual writer, theologian and painter, known under the pseudonym Obadiah Vostokov - Archbishop Anatoly of Mogilev and Mstislav. He was in Monastery of Garbovetsk until the end of his days after he died in 1860. The second monastery relic is the oak tree which is now five hundred years. The victim of a lightning strike it continues to live. The tree is protected by the State - it is the last representative of the once dense ancient forest. A few hundred years ago a monastic hermitage arose in the impenetrable thickets of the forest. According to the legend it was founded by a hunchback monk (from MDL. Word "Garbu" - hump). This explains the name of the monastery, as well as of the nearby village.